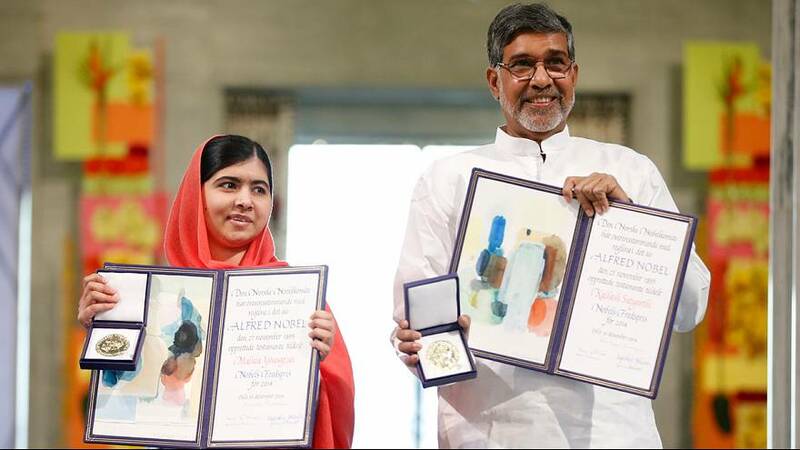 Two champions of children’s rights have received their Nobel Peace Prizes in the Norwegian capital Oslo. The award was shared between Indian anti-child labour campaigner Kailash Satyarthi, 60, and Pakistani teenager Malala Yousafzai, at 17 the youngest person ever to receive it. Both used the occasion to launch an impassioned plea for global action to make children’s education a reality. Satyarthi, whose Bachpan Bachao Andolan (BBA) Association is credited with saving around 80,000 children from slave labour sometimes in violent confrontations, asked audience members including the Norwegian royal family to put their hands on their hearts and listen to the child inside. “There is no greater violence than to deny the dreams of our children. Therefore, I refuse to accept that all the temples and mosques and churches and prayer houses have no place for the dreams of our children. I refuse to accept that the world is so poor, when just one week of military expenditure can bring all the children to classrooms,” he said in his acceptance speech. Earlier, Satyarthi said apathy was the biggest obstacle to eliminating forced child labour, adding that the world needed more secular education to reduce intolerance. According to the United Nations nearly 58 million children of primary school age are not in school; the International Labour Organisation estimates that 168 million children worldwide are forced to work, although that number has declined by a third since 2000. Malala Yousafzai said she would dedicate her prize money to the Malala Fund – starting by building schools in her home country of Pakistan where she survived being shot by the Taliban in her school bus two years ago. The militants singled her out because she had refused to quit school and had campaigned for the right of girls to have an education. “This award is not just for me. It is for those forgotten children who want education. It is for those frightened children who want peace. It is for those voiceless children who want change. I’m here to stand up for their rights, to raise their voice. It is not time to pity them. It is time to take action,” she told the ceremony. Both recipients received long standing ovations from the guests in Oslo city hall. The pressure is now on governments and other organisations to heed their calls. In the meantime the occasion was a striking display of unity – between India and Pakistan, and between Eastern and Western cultures.